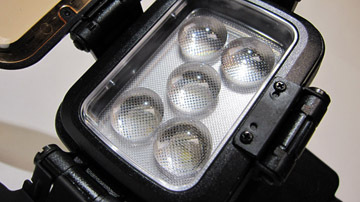 Comer CM-LBPS900 is a powerful, professional, low consumption 5-LED on-camera light. 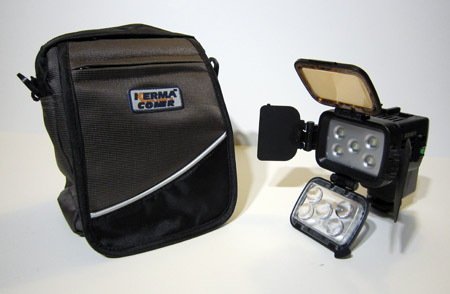 It has a solid sturdy casing built with barn doors, warming filter and condenser lens filter. 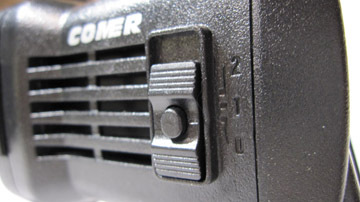 A full dimmer dial control provides maximum flexibility in shooting at different lighting environment. Posted by Paul Alexander on 5/23/2009 11:55:00 AM do you know which emitters ( LED's) this light uses? product brochure PDF to check out the specifications. Replied by LA Color Pros Dan, thank you for your comment. I'm glad the CM900 light works well for you. Posted by Ken on 8/15/2009 6:28:00 PM The light came within a week. I did a shoot at a night club with this light and it worked out perfect. LED is definitely the way to go. Awesome deal, thanks LA Color Pros! Posted by Sherri Nestico on 8/22/2009 10:00:00 AM All I can say about the Comer 900 is Wow! It's comparable to the size of my Canon Speedlite 580 EX flash unit for my still camera, so it's just the right size for my Sony HDR-XR500 handycam. And the amount of light the Comer can put out is amazing! I did a nighttime test in my home office just using the computer monitor as illumination. The Sony couldn't lock focus at all. Flipped on the 900 and suddenly I could clearly see my black cat laying on my black computer tower under my black desk. No low-light noise on the video at all, very clean. The 900 is a winner! Replied by LA Color Pros Technically you can say that. Comer 1800 brightness is measurred at 1800 lux at 1 meter. Comer 900 is 900 lux at 1 meter. 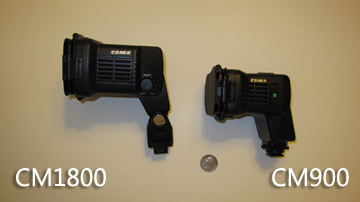 So if you set the dimmer on 1800 half way, it should give out the same amount of light Comer 900 does. Posted by San on 3/22/2010 1:43:00 AM Hi, I have a Canon HF S100, does this light double up as a flah light for taking still pictures besides being a video light? This light is a video light. It won't be firing flashes like a flash light. 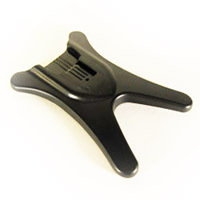 However, it is bright enough to be used in still photography without using any Flash light. Posted by San on 3/22/2010 2:01:00 AM Hi, thanks, also batteries on this video light are within the video light unit itself i.e don't depend on the camcoders batteries? Replied by LA Color Pros That's correct. 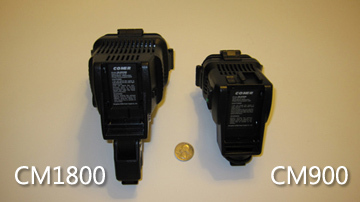 There're 4 models of Comer 900 lights that use different brand/model of batteries. However, there isn't one that uses the Canon HF S100 batteries. Posted by San on 3/28/2010 6:04:00 PM Hi, how much to ship to Sydney, Australia? Posted by jonathan on 4/14/2010 6:00:00 PM Hi, I do filming in concerts and weddings, alot of party footage at night, would i be better off with the 900 than 1800? Replied by LA Color Pros If you can afford, go with the Comer 1800 light. You never complaint it's too much light because you have a dimmer to adjust to the right amount of light you want. But when the location is dark, you only want to have more light. I have done enough weddings to realized 1800 is the right light to use. Replied by LA Color Pros The Comer 1800 light will fit well on your Z5U. 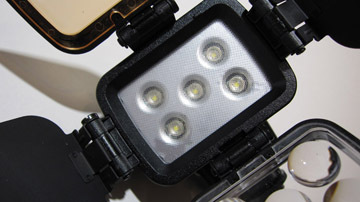 The 900 light is weaker in output and doesn't have a full dimmer (only 2 level of brightness). You won't be blinding people with the 1800 light as you can dim the light to the right amount of light you want. 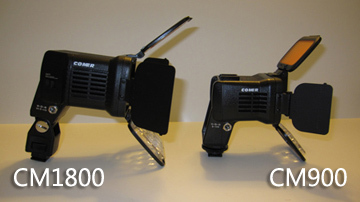 Posted by Kiaan on 5/28/2010 6:55:00 AM Is the Comer light mounted on teh Canon camcoder in the pictures a 1800 or a 900? Replied by LA Color Pros Picture on this page with a light on camera is Comer 900. Posted by Chris K on 7/17/2010 3:07:00 PM Wow!. I don't think I have ever been so pkeased with an online buying experience. The Comer 900 was processed within 30 minutes of ordering and delivered in 2 days. The light is better than I hoped and will be a regular part of my video shoots going forward. I had purchased a rotolight from another reseller and wasn't happy witih the output brightness. The Comer is versatile and small enough for my DSLR video workflow. I will definitely be an LA Color Pros customer going forward. Thank you! Replied by LA Color Pros Chris, thank you for your kind comment. We strike to provide excellent customer service. 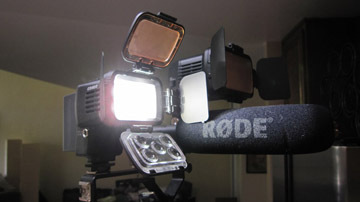 Replied by LA Color Pros We recently tried mounting the Comer 1800 light on Panasonic GH1. The setup look perfect. Consider the T2i is slightly bigger than the Panasonic GH1, you can judge it yourself to see if it's too big or not. Posted by Charles on 1/8/2011 12:36:00 AM Hi I'm interested in using this light with a Canon HF10. Is there anyway I can use an external dimmer with the Comer 900? 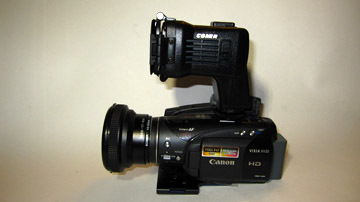 Posted by Antulio on 2/20/2011 8:35:00 PM Can the Comer 900 and 1800 be mounted on a Panasonic AG-HMC40 camcorder? Posted by Ralph on 3/27/2011 8:15:00 AM Do you think this is sufficient enough to light one-on-one outdoor interviews at night? I want the 1800 but it's unfortunately out of my budget and a little big for the camera I'm using. Also, does changing the brightness setting to 0 mean "off"? I don't see an On/Off switch on this. Replied by LA Color Pros Hi Ralph, yes Comer 900 is sufficent for interview shots. It wont light up the room but would be good for your application. 0 is the light OFF state. 1 is at 450 lux. 2 is 900 lux. Although it doesn't have a full dimmer like its bigger brother, the combination of Condenser lens, orange filter, and the barn doors enough to give you flexibility in different lighting requirement. Posted by Eugenio on 4/1/2011 9:26:00 AM I would like to see a picture of the comer 900 mounted on a DSLR, preferably in GH1 or T2i. I bought the 1800 with you and I really liked the product. Were the usage times for each battery calculated with the Comer at 900 lux? Would I then be able to double those times if I set the Comer at 450? It says 2 hours with the F570 battery, so would that mean I'd get 4 hours at level 1 brightness? Replied by LA Color Pros Ralph, technically it can power the light for 4 hours if you set the Comer 900 light brightness to level 1. We have never tested it but according to the rating, it should be. Can the 900 ad 1800 be tilted forward as much as 45 degrees for closer shots? Replied by LA Color Pros Comer 1800 can be tilted about 90 degree. 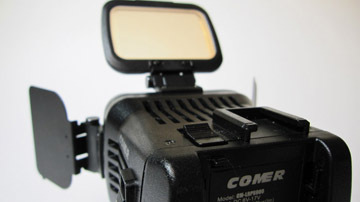 However, Comer 900 light cannot be tilted. Posted by Eugenio on 6/7/2011 7:25:00 AM Eu tenho o Comer 1800 e o Comer 900, mas meu preferido o 900, pois ele mais leve, compacto, eficiente e combina com as minhas handycams. Eu moro no Brasil e super indico a LA Color Pros. I have the 1800 and Comer Comer 900, but I prefer the 900 because it more lightweight, compact, efficient, and it fits my handycams. I live in Brazil is given over to LA Color Pros. Posted by Michael C. on 6/17/2011 4:43:00 PM I have two Panasonic camcorders and would like to use Panasonic batteries. Is there any way to do that? Adaptors? 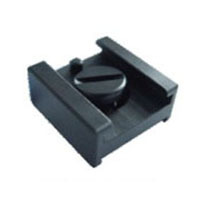 You seem to be one of the first distributors of this light in the U.S., can you talk to the manufacturer to provide a battery plate for Panasonic batteries like VBG230? 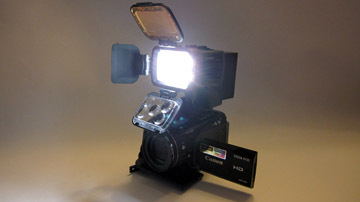 Replied by LA Color Pros There is already a Panasonic version of Comer 900 using a more popular Panasonic batteries. Even if it doesn't match your battery type, our Sony compatible NP-F570 battery is only $18 and can power the light for 2 hours. 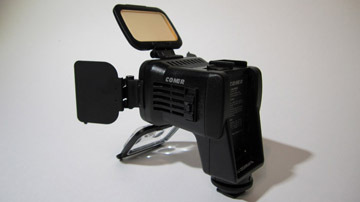 Posted by Vladimir on 8/26/2011 12:34:00 PM I ordered I bought Comer CM900 to compliment my Canon XF100 camcorder after trying Litepanels MicroPro LED which I was not satisfied with. Posted by red one on 2/25/2012 2:53:00 PM I just received the comer 900 with the sony 770 batteries. The light is bright! I just compared it to a litepanels micro pro and it blows it away! The long battery life and affordable battery options you provide was great too! Everything looks good except the switch to turn it on, on the side of the unit, only goes from "0" position to the "1" position. It will not go to the "2" position. 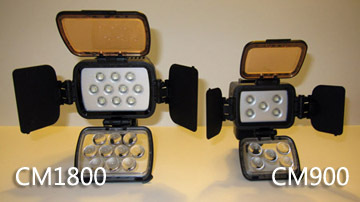 Replied by LA Color Pros Comer 900 light first came out with 2 levels of brightness without a dimmer. Now the second generation added a full dimmer control for brightness. 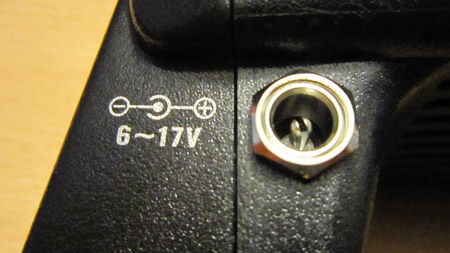 Thus, the 0-1-2 switch is now only function as on/off switch. Position 2 is not reachable. Posted by Celso Vitorino on 12/20/2012 6:29:00 PM I'm in the city of Leme, Sao Paulo state, Brazil. I bought the CM-LBPS900 with Mr. Taky for use in Canon 5D Mark II. It's perfect, use and recommend the product and the store LaColor Pros. Posted by picturelights1 on 10/8/2013 4:43:00 AM This is the best light ever! Replied by LA Color Pros Thank you for your comment. Posted by SANJAY S PAWASKAR on 2/18/2018 9:37:00 PM do you have that FLAXZY CL5L BOLT CONNECTOR WITH SCREW FTTING .I want two no of that pcs. Please send us quotation for the same.